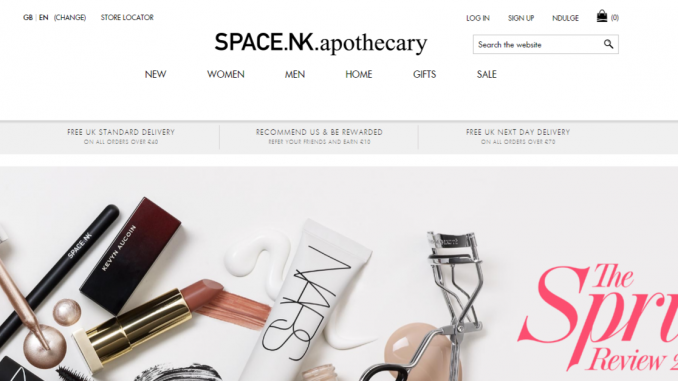 First the good news – there’s a new Space NK referral offer for 2017. Hurrah! We shall all have access to slightly more bargainous luxury beauty goodies. However, the bad news is that it’s nowhere near as good as the previous Space NK referral offers. They used to give out ace goody bags for referrals. But then that all got so popular that they ran out and had to pull the offer early. So for the 2017 referral offer there’s no goody bag. At least that way they won’t run out, since they don’t exist. Always a silver lining, if you look for it. What you do get with this referral offer is not to be sniffed at though. Use this referral link: http://referme.to/wlgIvEo and you’ll get £10 off your first online order plus free delivery (minimum spend £40). This is an online only offer and doesn’t apply in store. It’s for new customers, or at least customers with a new email address wink wink. Feel free to share that link with any of your friends or family who might be interested. If two people use my link then I will also get a £10 off and free delivery. See how that works? Everyone’s a winner, especially the people who wanted a few quid off some kickass red lipstick. This offer is now open until 15th December 2017, so if you’ve got your eye on some new skincare, makeup or even scented candles then feel free to use my link and save yourself a few quid. I can particularly recommend the Laura Mercier eye palettes and tinted moisturiser, Eve Lom cleanser and Diptyque candles. Plus there is a really gorgeous looking rose-themed By Terry travel skincare set which I think I’m going to have to fight somebody for.